Questions? - Handfastings by Cara, civil and religious marriage celebrant. Whether you choose a civil or religious ceremony your handfasting should reflect your beliefs. As an atheist, humanist, scientist or someone who simply wants to be married "outside the Church" a civil handfasting might be right for you. This is a secular ceremony where the marriage occurs under the authority of the state. 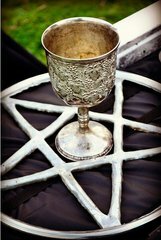 Religious handfastings tend to be requested by Pagans, Heathens and Witches and those who feel a spiritual connection to the earth. In such a ceremony the union is in accord with that which the couple recognize as sacred. Whatever type of handfasting you decide upon, your choice will not be questioned. Cara provides spiritual or religious services on a voluntary basis but asks that the couple to contribute to her costs in providing celebrancy services. Couples are also asked to cover any travel expenses and accommodation costs should it be required. Travel distances have ranged between 30 and 3,000 km in the past and this usually constitutes the largest expense associated with most bookings. Cara also provides recycled materials as much as possible, however where new materials are required these remain the responsibility of the couple. Couples should budget between $500 - $750 for a celebrant's fees and expenses. A detailed written estimate of expenses and fees is routinely provided, usually before the initial meeting. Use this form to request an estimate now. All couples are required to give a month's notice before they are permitted to marry. You will be required to complete a Notice of Intention to Marry, have your signatures witnessed and present the document to your celebrant (with the specified identification documents) at least a month before the ceremony. Only a Court may vary the notification period. The sooner you book the greater the chance Cara will be available to officiate at your handfasting. Must I change my name when I'm married? No. However if you do wish to change your name after you marry please contact the registrar of Births, Deaths and Marriages in your state. If you reside in Victoria the consult the BDM website for further information. All questions about marriage certificates should also be refered to your State Registrar of Births Deaths and Marriages. Where can I access Relationship Support? By law authorized marriage celebrants are now required to inform couples about relationship support services. Should you be in need of relationship support services Cara recommends consulting Relationships Australia. They have a wide range of services and programs and offices right across Australia. Cara also recommends talking to your GP who may refer you on to a local psychologist. If the issue warrants it ask your GP about a mental health plan, this may enable you to access a psychologist at a greatly reduced rate. If you're searching for a psychologist for Couples Therapy or other relationship services consult the Australian Psychological Society's directory of psychologists. Your rights are protected under Australian Law - ﻿consult the Code of Practice for Marriage Celebrants or ﻿﻿lodge a complaint﻿﻿.